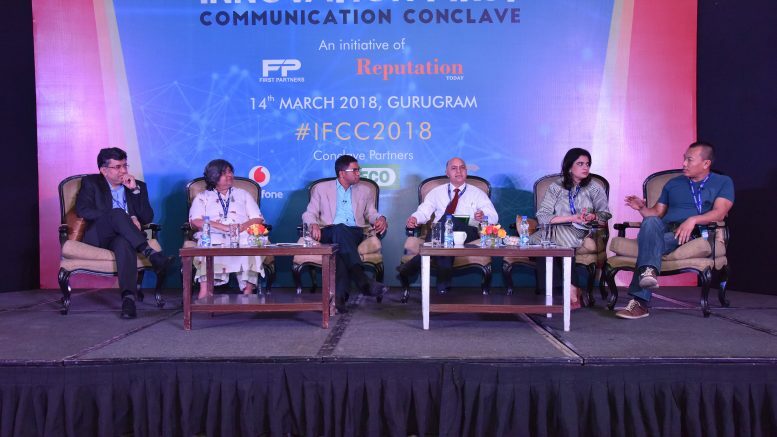 Why motivation in business and communication is key to win in a complex market like India was the panel discussion moderated by Pranjal Sharma, Senior Journalist at the Innovation First Communication Conclave. The panelists were – Arun Arora (Cairn India), Jyotsna Ghoshal (MSD India), Sarita Bahl (Bayer India), Senjam Raj Shekhar (Flipkart) and Shrutidhar Paliwal (Aptech). When Pranjal Sharma asked what does innovation mean to them – Senjam Raj Shekhar said that many a time, innovation equates creativity. For innovation to happen there must be three conditions – it has to solve the problem, it has to be disruptive and it has to be copied. Sarita Bahl said that innovation is a responsibility as it is a need. When we innovate, we look at ways of reaching out and we also have a responsiblility. “It’s a huge impact,” she highlighted. Coming to a definition of innovation, Jyotsna Ghoshal said it was about “thinking inside-the-box, and not outside-the-box”. Innovation is doing something differently. “If this discussion wasn’t there, maybe there would be a flash dance or a Quiz! !” she said with conviction. What she meant was don’t wait for a trigger before innovation. The message is the same, the audience is the same, it’s how we say it that is different! “At Aptech I think the real challenge is in internal communication,” felt Shrutidhar Paliwal. With so many different ethnicities, how do you get them on the same plane? So, their CEO wanted a Karaoke Bay, and that was introduced during off-hours! This got the entire team together, he explained. There was enough on the ‘C’ word (communication), and the conversation moved to the ‘M’ word – Message. Is there any relevance in messaging? What is innovative in messaging? It is important that PR messaging depends on clear communication. Any good PR messaging strategy involves conveying to the public both your core company values and the benefits you can provide them with. Jyotsna referred to the way they changed their tagline to –“inventing for life” which actually “gave an overall positioning and changed the game” for them! When it came to communication beyond urban areas, Senjam pointed out there were two sectors which have done well – the political sector (elections) and public health sector (polio, etc). Is communication keeping pace with innovation? As communication leaders, which comes first – message or innovation? Here Senjam Raj Sekhar clearly said that narrative is most important. Giving another angle to the innovation story, Arun Arora put forth the idea that we can have an Innovation Room, where we can sit and innovate! The finale statement came as a question from Aseem Sood sitting in the audience, “Do you ever ask yourself – are you innovating enough?” Seriously, are we? Be the first to comment on "Innovation is thinking inside-the-box, and not outside-the-box!"